I received a copy of Scott Linden's book in the mail, from Skyhorse Publishing. I'm a reader, and a voracious reader of bird dog books, dog books, hunting books, books about dogs hunting books...you get the picture. I was very interested in Scott's book, because my impression is he is a bird dog man and bird hunter. I don't mean merely a man with a bird dog, Lord knows there are plenty of those. I mean someone who values time afield with his dog and finds more to it than killing birds. This book reinforced that perception, big time! I read it in one day. It took me a few more days of digesting and note taking and pondering before I could really form an opinion. But, I finally recognized that Scott's book is a 'must buy' for new bird hunters and old, broken down traveling wingshooters, as well. I learned some stuff and a lot of what I thought I knew was validated. For example, my third bird dog I named "Bo". Of course, that sounds a lot like "whoa" and "go" and "over" and really is a very poor name for a bird dog. I remember yelling "Bo", at the top of my lungs, during a training run. All four dogs on the field came to a screeching halt! Embarrassing! 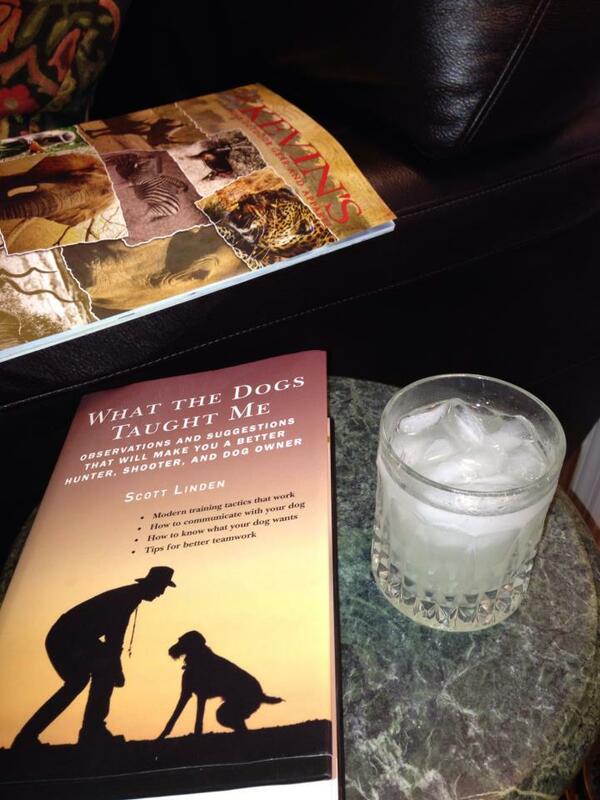 As a new bird dog man, I would have learned about that in this book and avoided the situation, altogether. The book is divided into several sections, each valuable. The first three deal with the dog and focus on what's between his ears. What he wants, how he thinks and how you can communicate with him. "When discipline is applied appropriately, instruction is melded with encouragement while correction is levied with restraint and sensitivity. I think your dog acquires a sense of "fairness"." "An honest relationship is easier to maintain if you are consistent: same words, same tone, same expectations every time." Truth. Shooting, training and hunting are addressed next and contain nuggets for new and experienced alike. Remembering to keep structure in your dog's life and keeping you at the head of the pack is critical, "Without order, chaos reigns, and dogs don't like chaos." How many times have I had an easy double in front of me and bagged none? "Shoot the first bird first, see it drop, mark it carefully. Only then, and if you have time, should you contemplate a second shot." Yep. The hunting section is chock full of valuable information. Stuff I learned over 20+ years in the field with my dogs. Scott has graciously written down the good stuff for the new guy. Learning from your mistakes is good, but learning from the mistakes of others is wise! Scott approaches the care and feeding section head on, providing useful and accurate information on what is takes to keep Old Buck up and running for a long road trip. His information is about hydrogen peroxide is right on! His first aid tips are worth memorizing. Before moving to the meat of the book, I tried to navigate through Chapter 8 and the "Road to the Utility Test". I plugged through it and found plenty to like. I'm not a utility test kind of guy, but I know many are and this section will not disappoint. Hunting skills and tips from pros and a Q and A section are really the heart of this book. This is the "How to Bird Hunt" section. I enjoyed, so much, perusing the skills imparted here. I remember when I learned how to tell the amount of daylight left by using my extended hand. I marvelled at such a simple and accurate way to measure how long I had to get back to the truck. Scott includes that, as well. Skills hard learned by others are listed here for the novice or experienced hunter to learn: making fire, using a map (critical! ), telling time, jump start a truck, breaking up a dogfight, driving on muddy roads, cooking game, delivering the coup de grace to a game bird, and helping someone find you. If you aren't familiar with all these, don't head up that two-track. To summarize: Get this book. Better yet, buy two and give the book to the new guy, too! Congratulations, Scott! I know it took a lot of effort, but you have a winner.